Mountain Estates has been recently built out over the last couple of years. New model homes are being built by D.R. Horton and are ready for sales. Prices start in the mid $300,000s. Search current inventory in Mountain Estates. Mountain Estates brings you both the distinctive exteriors and meticulously crafted interiors of today's modern homes at an affordable price. Built on generous landscaped lots with a backdrop of the Shadow Hills Mountains, each home has breathtaking views. The new floor plans at Mountain Estates range from 2351 square feet to almost 2800 square feet. Some floor plans include casitas and/or 3 car garages. Most homes feature two fireplaces - one fireplace in the living area and one in the master suite, covered patios to enjoy the outdoors, 9-foot volume ceilings throughout, and spacious great rooms. Mountain Estates is a gated community with all single story homes that will have approximately 110 homes at build out. The current monthly homeowner's fee is $85 and covers the gate, perimeter wall, and common areas. Conveniently located minutes from golf, entertainment, shopping, and restaurants. 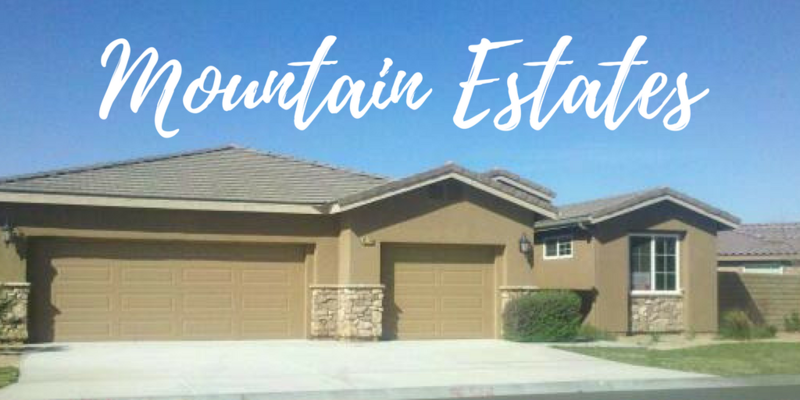 With easy access to Interstate 10, Mountain Estates is an ideal place to call home. The community is located off Ave 42 north of I-10 and just a couple blocks to the Golf Club at Tarra Lago. Please contact me for more information or to schedule a home show in Mountain Estates.